The geologist who wishes to study rocks is faced by a major problem: Rocks must be studied in the field and the best outcrops have the nasty tendency to be located in difficult terrain, in desolate landscapes, in narrow gorges and steep mountains - and because the mountain normally doesn't come to the geologist, the geologist has to travel to the mountain. Geology usually requires outdoor activities in remote, inhospitable and often hazardous environments. Originally this was perceived as a occupation for a working-class man who, dressed in appropriate clothes, ragged and dirty, was forced to be in the field. It was hard to imagine that a gentleman would engage in such an activity and it's seemed even less comprehensible that a woman could and should be allowed to the same thing! As results of these social prejudices throughout history women geologists have encountered difficulties travelling and working in the field, whether their sites of interest were close by or abroad. Excuses to prevent women engaging in geology could be the simple lack of unsuitable clothes, the lack of proper funding and the inappropriate appearance of a woman travelling alone, to more direct reasons like sexual harassment and open discrimination. 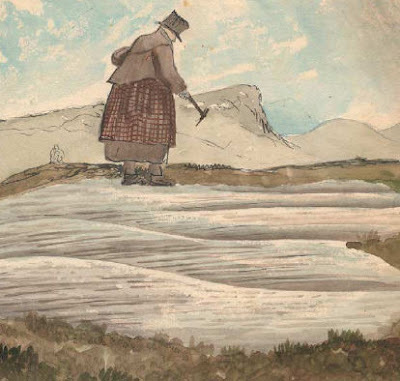 Solitary girls and women working in the field however were tolerated in the social lower classes, like professional fossil collector and dealer Mary Anning (1799-1848) of Lyme Regis (Dorset), but for upper-class women engaging in field research was much more difficult. Woman could minimize these "problems" by collecting fossils and studying rocks in their local environment, for example on private property or in the surroundings of their home, where their social status was known and their behaviour somehow tolerated. However upper-class women had to face inevitably troubles as soon as they left familiar paths. "A lady going into the quarries is a signal for the men begging money for beer, and the few times I have been there [i.e., in Portland] I never got a specimen worth bringing home. All my Portland fossils have been purchased in Weymouth!" "After the last Geological Society meeting of the spring season, the leading researchers gathered up their hammers and their wives and set off on extensive stratigraphical tours." The problem of the clothing persisted almost until the 19th century, even a gentleman geologist was expected to wear cylinder and tailcoat in the field, and women dressed according to the most recent mode with "cages" and "horrid iron girdles round their legs" (Roderick Murchinson in 1850 on his wife, who accompanied him into the field). "Hammer in hand; Mary is depicted wearing sturdy boots or clogs, heavy clothing and a top hat, the protective clothing of a working-class woman. Top hats, made of felted wool repeatedly coated with shellac until quite stiff, might appear oddly formal today, but they were the crash helmets of the time and were worn by many geologists when they were doing fieldwork in order to provide protection from falling rocks." (GOODHUE 2005) Fig. 1. Cartoon of Mary Anning working in protective gear, painted by Henry Thomas De la Beche. (GOODHUE 2005). With the development of public transportation systems in the 18-19th century, like the train, travelling became less complicated and accepted by society also for women - by travelling in a "closed box", women became highly mobile but could maintain their "required" privacy. The first field trip of the Geologists' Association's of the United Kingdom, with many women geologists participating, was also made by train, the trip April 9, 1860 lead to Folkestone, the second to Maidstone (June 19, 1860) to inspect the Hythe beds, which had yielded the type specimen of Iguanodon mantelli just 26 years earlier. Fig.2. Geological excursion by train in 1914 by the Geologists' Association to Hertford (BUREK & KÖLBL-EBERT 2007). Later, cycling excursions were introduced by the society but these proved much less popular. At the beginning of the 20th century a even more practically vehicle was introduced: the autobus, followed soon by the private car. The Society of Petroleum Engineers and a couple of geophysical organizations still have Wives' Clubs. Absolutely provincial and disgraceful, in my opinion. a) Where's my husband to go? b) Do these women not have things to do besides hanging out with other women in the context of their husbands' job? Also, I've accompanied my husband on his conferences before and have found stuff to do that did not involve being accompanied by other "bored" wives.